The Huawei MateBook 13 delivers the kind of sensibility we’ve wanted from a luxury laptop. It does what any flagship laptop can do but at a killer price. For that, the Huawei MateBook 13 is our Best in Class laptop in 2019. 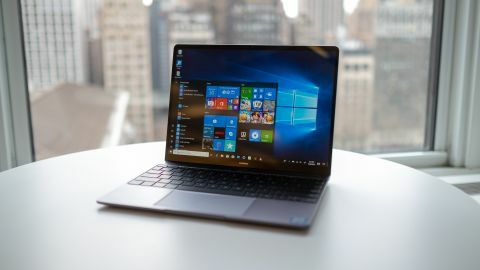 Huawei proved it has the skills to produce a class-leading laptop with the high-end Huawei MateBook X Pro, and with the MateBook 13, it brings all that experience into a more affordable product. The end result is yet another Best in Class laptop from Huawei. The MateBook 13 offers better performance than most laptops of its class for less cash. Not to mention all within an equally gorgeous form factor that’s almost better looking and feeling than a 2018 MacBook Air – almost. Sure, you may be missing a few minor niceties here and there to achieve such a competitive price, but on the whole, this is the most value-packed flagship laptop that we’ve ever tested. Huawei is selling two configurations of the MateBook 13 laptop, an entry-grade version and a high-end version, but both contain the same 13-inch, 2,560 x 1,440 (220 pixels per inch) touchscreen in a 3:2 aspect ratio and 8GB of LPDDR3 memory as well as a fingerprint reader embedded into the power button. Otherwise, the more approachable model includes an 8th-generation Intel Core i5 processor with integrated graphics and 256GB of solid-state storage (SSD) for AED 2,999 / SAR 2,999 to start. Meanwhile, the AED 3,999 / SAR 3,999 model gets you an Intel Core i7 processor and Nvidia MX150 discrete graphics chip as well as a 512GB SSD. Both models also include a helpful USB-C dock in the box as well as one free year of Microsoft Office 365 Personal. This pricing undercuts Apple’s latest MacBook Air by over AED 1000 on the lower side while offering double the storage. On the higher-end, the price difference is even more visible at over AED 2,000 with Huawei, again, offering double the storage as well as discrete graphics. As low-power as the Nvidia MX 150 might be, it still gives the MateBook 13 a clear competitive advantage in video rendering and gaming. Both models are now available either through Huawei's online store in the UAE and Saudi Arabia or Huawei Experience Stores across leading malls in the Middle East. You wouldn’t be wrong to think of the MateBook 13 as a further refinement of Huawei’s best-in-class MateBook X Pro of 2018, but the company intends to sell both separately. You see, the MateBook 13 looks nearly identical to the X Pro, only slightly smaller. This laptop is fitted into the same aluminum body as before in your choice of a Space Gray or Mystic Silver color option. Open the laptop, however, and you’ll notice one key difference: the webcam has moved. While the webcam was cleverly hidden beneath the keyboard in the X Pro, Huawei has done this MateBook right with a webcam resting above the display. However, it’s rated for a mere 0.9-megapixels at 720p resolution, so it’s not going to make you look amazing online. Measuring just 0.59 inches (14.9mm) thin and weighing a mere 1.3kg, the MateBook 13 is narrowly heavier and actually – just by a hair – thinner than the latest MacBook Air. That’s mighty impressive for a laptop that contains a full-fat Intel mobile processor as well as a dedicated graphics chip. Equally as impressive is the keyboard and touchpad on offer here, with plenty of key travel at 1.2mm and the punchy, forceful feedback that we need to type fast. Likewise, the Microsoft Precision touchpad is also a delight to use as well as wide and spacious, though it’s notably missing a smooth glass coating. Now, if you enjoyed the touchscreen display on the X Pro, you’ll love it all over again on the MateBook 13. While a touch smaller now at a straight 13 inches on the diagonal, the screen still puts out a 1440p picture at 100% of the sRGB color gamut – and its touch digitizer is as snappy as ever. Couple that with a 1,000:1 contrast ratio and up to 300 nits of brightness, and you have the makings of a once-again excellent display. The 3:2 aspect ratio allows for more content to fit on the screen vertically, but that means thicker bars above and below your full-screen videos. While this is essentially the same design as last year’s flagship Huawei laptop, we can’t help but appreciate the refinements that the company has made to that design at almost every level.